Join us in making change happen! 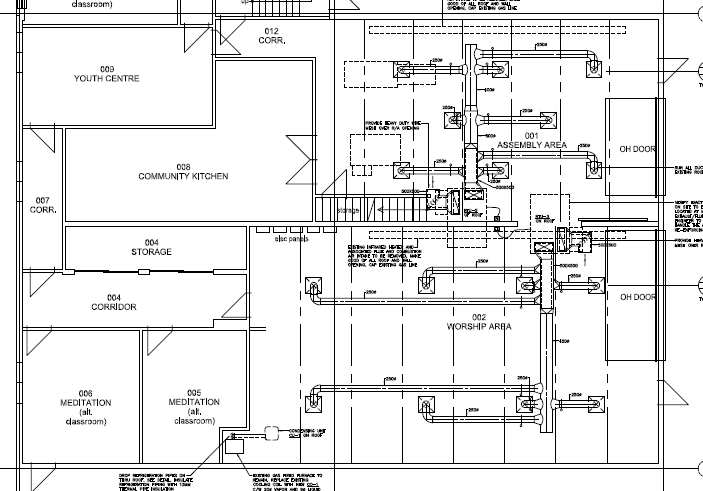 • This project includes an installed proper HVAC (Heating, Ventilation, and Air Conditioning) systems to service our JLI Study Hall, sanctuary, social hall, kitchen and youth centre classrooms. • This allows functions and gatherings to be held in a properly ventilated and temperature regulated area. • A make-up-air unit, which provides fresh air to the kitchen, is also in place. • Our commercial kitchen will include proper commercial appliances and equipment, stainless steel work areas and shelving, proper storage and drainage, new fridges and freezers, and more. • With a Public Safety of Canada matching grant, our upgraded security system will include the installation of 25 security cameras and recording system, security film on doors and windows, LED lighting outside, anti-graffiti spray, an alarm system, intercom system, upgraded access system and locks. • A special thank you to Leonard & Faigel Shapiro for spearheading this campaign with a very successful and generous matching grant. Dedications will be recognized on a plaque affixed at the Chabad Calgary Campus. Click here to make this miracle happen!